Aging is an inevitable biological reality for all of us. Along with progression of age, sharpness of perceptive faculties decreases and our physical strength ebbs away. Noted English bard William Shakespeare has, in one of his works, mentioned that the condition of an aged person is just like that of a child in the cradle – helpless and toothless. Undoubtedly, old age brings with it a number of challenges. It is not uncommon to find people on the verge of retirement refusing to take up new responsibilities. After struggling hard throughout their life for earning money and maintaining a family, they wish to retire from everything and enjoy life, waiting for a peaceful end. However, there have been notable exceptions where people have begun their career late in their life and went on to become famous successful people. Hearing such stories gives us tremendous inspiration and hope. In this article, we will see the stories of two personalities who began their spiritual mission at a very advanced age. Their contributions are invaluable, predicted to benefit humanity for several thousand years. Srila Krishnadasa Kaviraja Gosvami is the author of Sri Caitanyacaritamrta, a philosophically profound biography of Lord Caitanya Mahaprabhu. 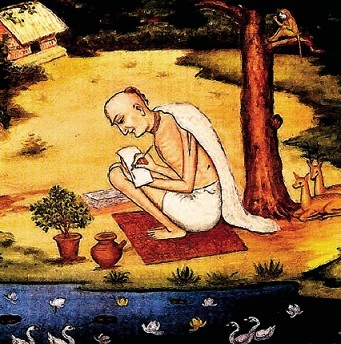 Several biographical works had already been written on the life of Sri Caitanya by contemporary and nearcontemporary scholars and devotees before Krishnadasa began his work. Most of these works described the early life of Lord Caitanya, but none of them described the Lord’s later pastimes. Eager to hear these pastimes, devotees requested Krishnadasa, whom they respected as a great devotee, to compose a book that narrated these later pastimes. Krishnadasa Kaviraja Gosvami began this work in his late nineties and in failing health. He vividly describes his condition in the text itself: “I have now become too old and disturbed by invalidity. While writing, my hands tremble. I cannot remember anything, nor can I see or hear properly. Still I write, and this is a great wonder.” Sri Caitanya-caritamrta is considered the greatest literary gem of medieval India. A more modern example, of course, is of His Divine Grace A.C. Bhaktivedanta Swami Prabhupada. At the advanced age of 69, he traveled to the West on a cargo ship where he suffered two heart attacks. 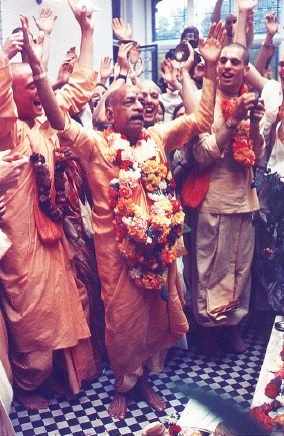 Penniless and without any support, he arrived in New York City, and it took him almost a year to establish the International Society for Krishna Consciousness (ISKCON). Skeptics may downplay such achievements by not attributing any divine cause to their successes. There have been many late bloomers in other fields too, they may argue. What they fail to understand is that a person situated in material life is motivated to work for his own personal interest such as achieving name, fame and money. Pure devotees of Lord Krishna, on the other hand, act selflessly to spread His glories and benefit all living entities. They work tirelessly day and night, despite their advanced age. Thus it is incorrect to equate the success of a materialist with that of an exalted devotee in the spiritual realm. The Vedic scriptures narrate the story of Hiranyakasipu, the demonic king who performed severe austerities to appease Lord Brahma and obtain various benedictions from him. However, he used those benedictions for personal gain by exploiting others. Materialists display a similar tendency by using the fruits of their successes in destructive ways. Exalted devotees are not exempt from undergoing the miseries of material nature. Like everyone else, they too have to face old age and disease. However, the power of their devotion helps them transcend such miseries and focus on the service to the Lord. For such exalted devotees, it can be said that age is just a number. Jawahar Trivedi is a lawyer and an ISKCON life member. His family had the great fortune of personally meeting Srila Prabhupada.